I was initially diagnosed with an unspecified form of muscular dystrophy at the age of 25 years old. 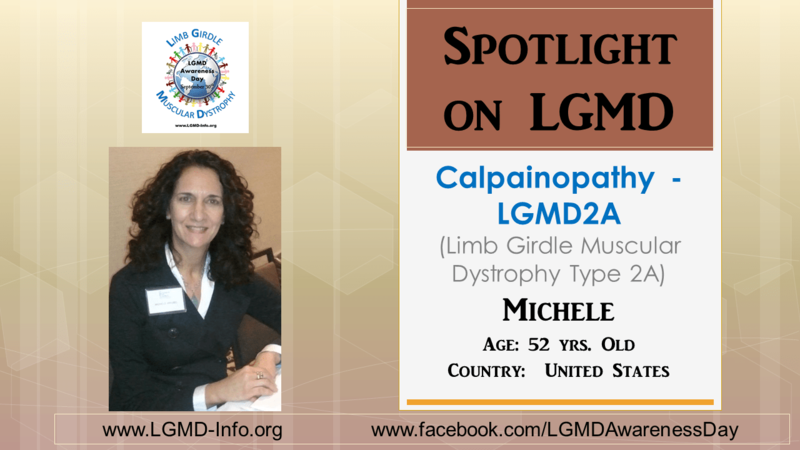 I received confirmation of my LGMD2A diagnosis at the age of 43. In my late teens I developed an awkward waddle when walking and in my early 20’s began limping. Yes, one sibling has LGMD2A but the other does not. To be blunt, the worst part is dealing with public restrooms because the transfer to/from a wheelchair is physically difficult and the restrooms are not always adequately set-up so I am always worried about drinking water or coffee while I’m out. Sometimes it feels as though my life revolves around fluid management! 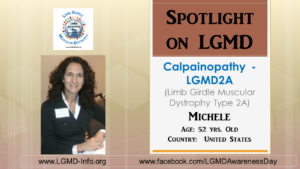 Professionally, my greatest accomplishment is my involvement in the creation and management of Coalition to Cure Calpain 3 (C3) which is a non-profit group focused on funding high potential research to cure LGMD2A (also known as Calpainopathy),and educate the global community about the disease. On the plus side, it has made me more empathetic and given me the opportunity to show my children that it is important to take action when you are frustrated with the state of things. Don’t complain; be an agent for change. On the down side, it has made me adjust my daily life as my mobility has worsened, and while I certainly make the most of my life and am generally happy and productive, it certainly presents its challenges, and that can get tiring physically and emotionally. We need more funding for research and more scientists engaged in finding a treatment or cure. Ride a bike (preferably a pink Schwinn with a basket on the handlebars and a thermos of coffee) to the beach and walk along the jetty with my family.